No matter how hot it gets outside, my family enjoys taking advantage of our backyard. It’s one of the reasons we bought our current house. 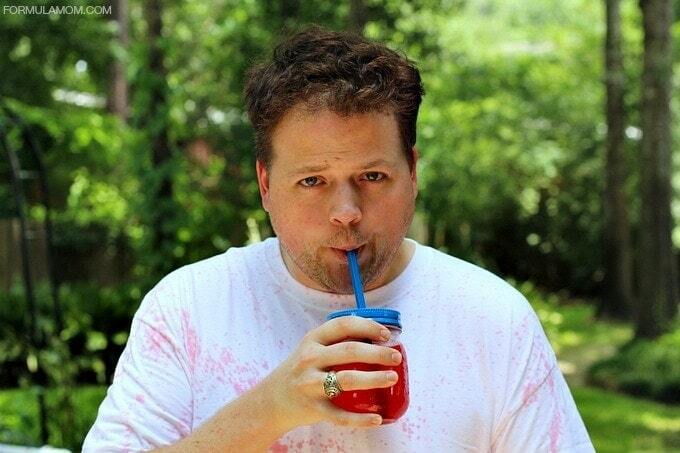 When we’re outside we always have drinks on hand and some of our favorites include our favorite juice drinks. But recently we got some new squirt guns and I wanted to plan a little fun! So I swapped out the water and used our Kool-Aid! Summer afternoons in Texas mean that I’m always on the hunt for fun ways to cool off. 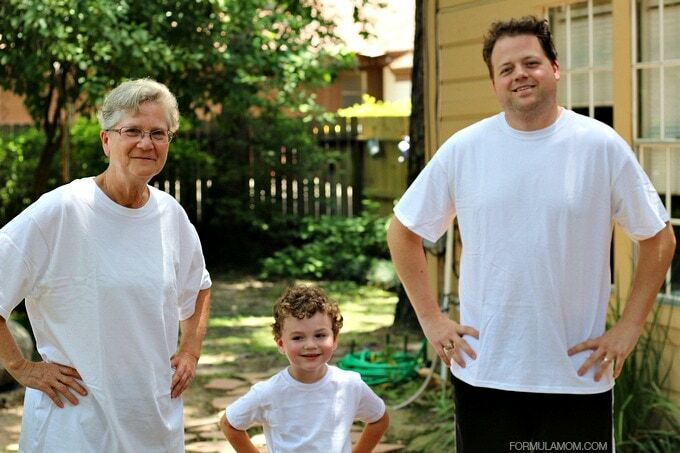 Having a family water fight has been fun for the entire family. We’ve done it a few times and it has quickly become one of our favorite ways to have fun without spending much money! We also love getting creative and making arts and crafts. So when I spotted the 96 oz. Ready-To-Drink Kool-Aid, I immediately knew how I could combine some of our favorite things and have even more fun! 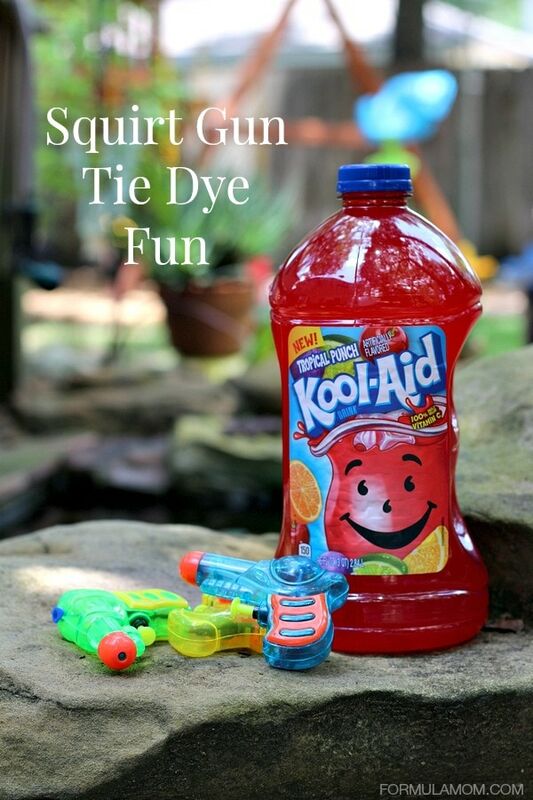 I was ready to surprise the family with Squirt Gun Tie Dye fun! I only had one little challenge as I prepared for the fun. 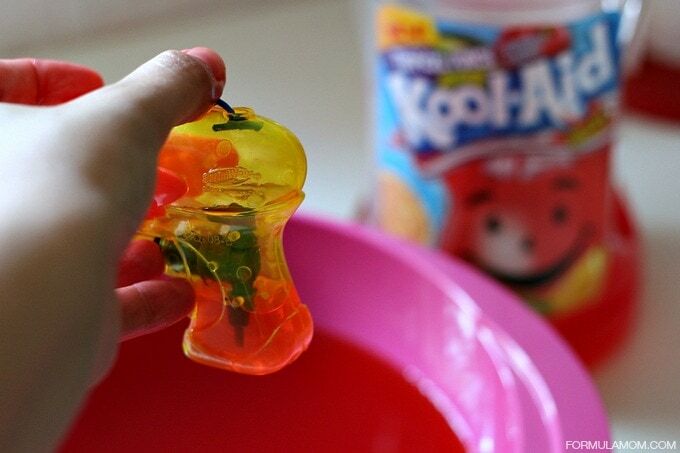 I had to figure out how to fill the squirt guns with Kool-Aid! I couldn’t just pour it in because I bought small squirt guns. I didn’t want to waste any of our Kool-Aid. So I filled a large bowl with the juice drink and held the squirt gun under the liquid to fill it. I used a small cup to pour in a bit more and top of each squirt gun. Fill the squirt guns with Kool-Aid. And the the fun began! I love watching my family smiling, laughing, and making memories. Since I became a mom, I have really come to appreciate the small moments. Sometimes it’s the simple things that leave the most lasting memories. While our squirt gun tie dye fun wasn’t very complicated, it was more fun than some of the bigger things we have planned with the family recently. Sometimes simple fun is perfect fun. While it was a blast to break out the squirt guns and fire away as everyone ran around the yard. It was also fun to see what designs and creations we made while doing it. I had pink fingers from filling the squirt guns with Kool-Aid and the juice drink left great color on our new white shirts! 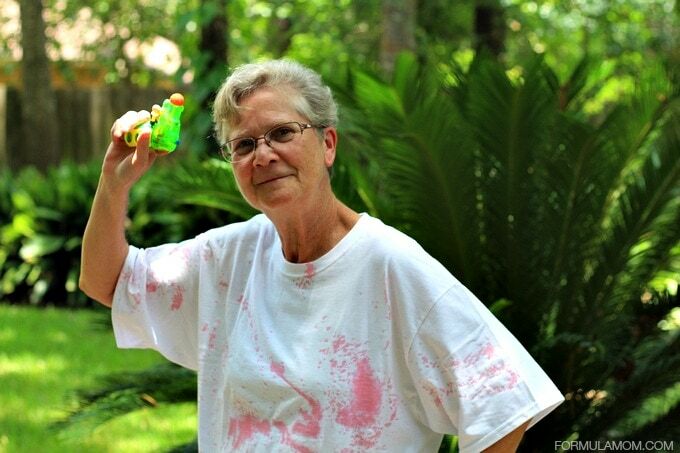 If you plan on having Kool-Aid squirt gun fun, I definitely recommend picking up some plain white shirts or some old white shirts you have laying around the house. And we all wore dark colored shorts too so they wouldn’t be ruined! After running around in the afternoon heat, our 96 oz. 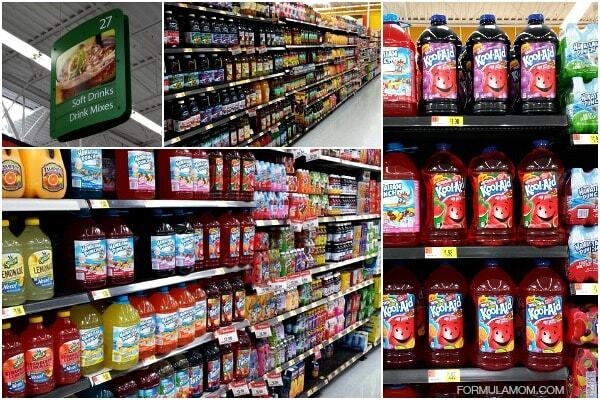 Ready-To-Drink Kool-Aid was the perfect juice drink to help us cool off. J said it reminded him of being a kid. That was music to my ears! It was definitely a throw back to the simple summer fun of my childhood when we would just make up silly games to entertain ourselves. And picking up all of the supplies I need at Walmart made it easy to get prepared for our fun! What is your favorite simple way to have fun with your family? If you’d like to learn more about the new 96 oz. bottles, see if pro fisherman Jim Dillard is coming to your local Walmart to promote the new bottles! There will be product giveaways, t-shirts, games, and more fun activities! Is he coming to your store? How did you set the colors afterwards? Not that red Kool Aid won’t stain anyways but some of the other colors may not. We didn’t actually set the color in! I washed the shirts and most of the color came out so we can use them again! We’re going to use a few different colors next time! But I would use vinegar if you want the color to stick! We did tie dye at an open house for my son’s online school. They told us to set the dye with vinegar after it dries and then wash them. 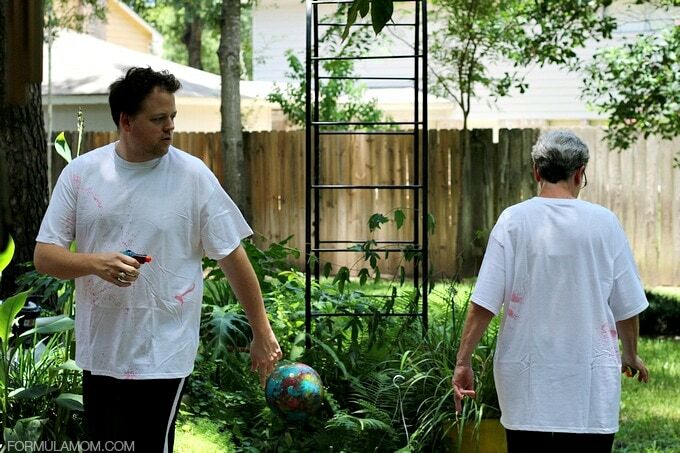 We did the squirt gun fight at a friends house a few days ago with tempura paints. I like the Kool Aid better.